Buried deep in Egypt’s Nile Valley lies the village of Beni Hasan, known for its ancient cliff tombs dating from 2000 BC. A drawing decorates one tomb, showing two men holding sticks with curved ends and standing over a ball. Add synthetic turf and shin guards, and it might pass for hockey at the Sydney 2000 Olympic Games. One of the world’s oldest known sports, hockey predates the Ancient Games of Olympia by perhaps 1200 years or more. Indeed, historians believe it existed in many of the world’s early civilizations. 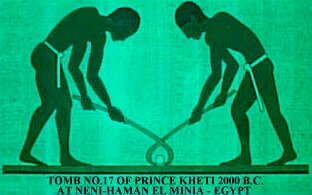 The Arabs, Greeks, Romans, Persians and Ethiopians all played variations of the game. Several centuries before Christopher Columbus found his New World, the Aztec Indians were playing it in Central America. The Araucano Indians of Argentina invented a game similar to hockey called Cheuca, believing it would make them better warriors. The modern game we know as hockey - or field hockey, for those distinguishing it from ice hockey - evolved in the British Isles in the 19th century. It was a popular English school game, possibly adapted from the Irish game of hurling. The British army helped spread hockey internationally through the British Empire, its popularity especially booming in India and Pakistan. The London Hockey Association formed in 1886, and rules soon were standardised. The International Hockey Federation (FIH) formed in Paris in 1924, and the International Federation of Women’s Hockey followed in 1927. Men’s hockey first appeared at the 1908 Olympic Games in London. It reappeared in Antwerp in 1920, then returned to stay at the 1928 Amsterdam Games. Women’s hockey waited much longer, finally debuting in 1980. "India won six straight Olympic gold medals while winning 24 consecutive matches between 1924 and 1956, a record likely to stand through the ages. The Indians have won two more gold since then." One name evokes the memory of their dominance: Balbir Singh. It’s one name, five people. The first Balbir Singh played with the great Indian teams of 1948, 1952 and 1956, his glory peaking at Helsinki in 1952 when he scored five goals in a 6-1 gold medal victory over the Netherlands. The four later Balbir Singhs played with the later Indian champions. Pakistan finally broke India’s hold on the sport in 1960, a decade when the two would keep taking the gold from each other. Now, as the Dutch men and Australia’s women head into Sydney as defending champions, no team has won consecutive gold since the legendary Indian run.